WebsiteBuilder.com Review - My favorite website builder? 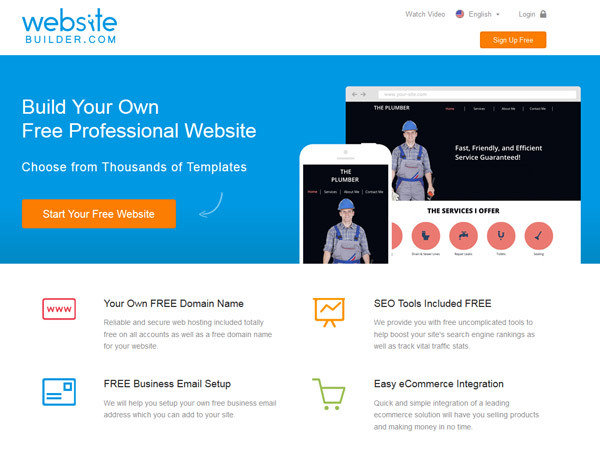 WebsiteBuilder.com Review – My New Favorite Website Builder? That’s right – as of now, WebsiteBuilder.com is my favorite website builder. I’ll show you why, but keep in mind that just because it’s my favorite, doesn’t mean it will be the best option for EVERYONE. But I think it will definitely be a solid option for most people looking for a website builder, and especially those who have a bit of web design experience. I’ll explain why below, but watch my video first. I was contacted by WebsiteBuilder.com when they launched in 2014 because they wanted me to review their builder. I must admit, I was impressed by the domain name they acquired, but all the website builders I love have a brand name (Weebly, Wix, Squarespace). There’s something about a generic name like WebsiteBuilder.com that raises red flags for me. Even their website sales page at WebsiteBuilder.com, although attractive, is on the generic side. Since first contacting me, WebsiteBuilder.com has come a long way in getting ranked in Google for “website builder” keywords and attracting a lot of customer. Based on the increased popularity, I had to take some time to take a look at it. 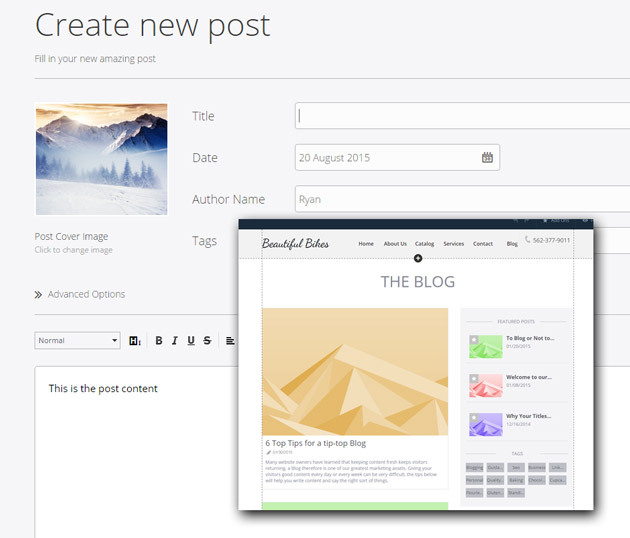 Enough talk – Let’s take a look at what this website builder can do. Luckily, WebsiteBuilder.com is pretty new, so it’s impossible for the design themes to be old and outdated. 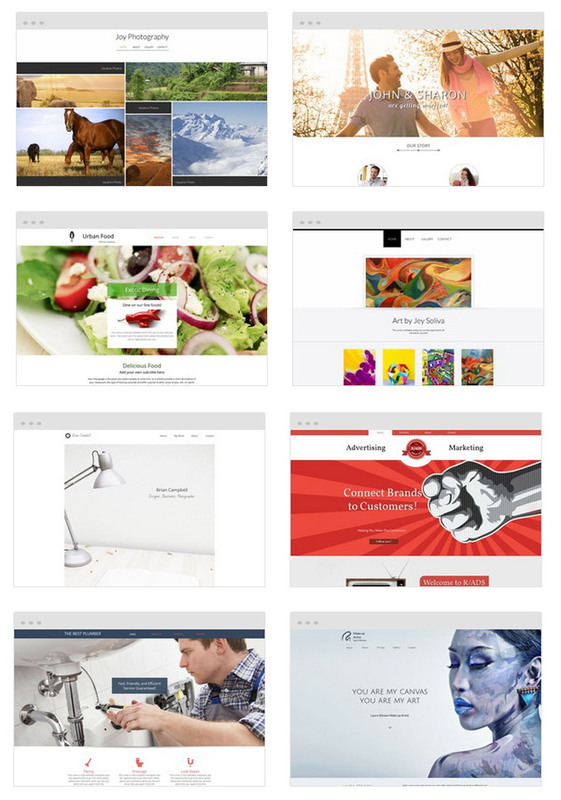 The design themes are more than just “not bad” though, they are a major selling point of this website builder. There are over 600 designs to choose from and they are divided into useful categories like Blog, One-Page, Wedding, etc. so you can easily find one to fit your site fast. They also offer blank templates which normally would be a scary proposition in most website builders, but because of the capabilities this builder offers and the fact that the blank templates do offer a framework to start from, many people will choose to start from scratch with a blank template. My inner geek was smiling as I began to play around with this website builder. It is awesome and combines some aspects of some of my favorite website builders (Wix, Weebly, and Squarespace), but expands the features and capabilities beyond anything I’ve seen in other website builders. You’ll have to watch my video above to fully appreciate the website editor offered by WebsiteBuilder.com in it’s full glory (or you can try it free here), but here are some of the highlights. The elements made available in a website builder really make or break it because it’s how we actually build the site. WebsiteBuilder.com offers a ton of elements that you can drag to your site including common elements like Images, Text, Galleries, Buttons as well as some advanced elements like Scolling Navigation, Box and Tab Containers, Shapes, and more. One of the things I love about this website builder is the ability to customize elements after they are added to the page. Click any element on the page and settings pop up on the right including Settings, Style, and Size/Position. In Settings you can add an HTML5 tag to the element (nerd alert!) and add an element behavior like animations, video play, and navigation events. 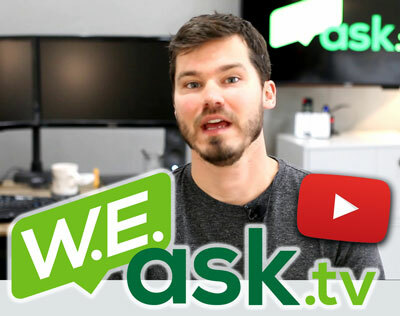 The animations are a play smartly stolen from the Wix playbook, something that sets Wix apart. But now WebsiteBuilder.com offers it and some of the other behaviours offered are options I’ve not yet seen in other website builders. Speedy! – No really – it’s freakin’ FAST! This website builder is noticeably FAST. I’m not sure if it’s the hosting architecture where it’s running or the software behind the builder, but it’s probably both because it tears along as if as if you’re using software on your local computer. Actually, it’s faster than a lot of software on my computer! It’s also setup in a very intuitive way similar to Weebly where your next click is obvious and windows open up in convenient spots so you can change options and see the results of those changes quickly. “Sections” sounds like a pretty generic and boring term, and fails to represent the unique page building power sections wield in allowing you to piece together unique pages utilizing the freedom usually only comes with custom coding a website from scratch. A lack of customization is usually a major downside of website builders, but WebsiteBuilder.com has struck an excellent balance of customization without the complication of code. When you choose a design template, there will already be pre-populated sections built into the design. You can edit them, delete them, and change their settings just like individual elements. But the difference is – these sections have different elements inside them. So the result is a nested effect that is typical of web design, but not usually offered in website builders. Sections also separate your page into distinct design areas with different colors and background images, something that is very common in modern web design and especially one page designs. After starting with a website design theme, you can also add new sections to the page by clicking a plus sign between section to bring up the “Add New Section” box. WebsiteBuilder.com give you more than 100 commonly used sections that you can add to the page and then customize by dragging and dropping elements. Very cool – and you may not understand how useful this is until you try it yourself. A Website Builder for Designers and Developers? Most website builders are designed for beginners to use – people who have no knowledge of HTML or CSS and have never built a website before in their life. 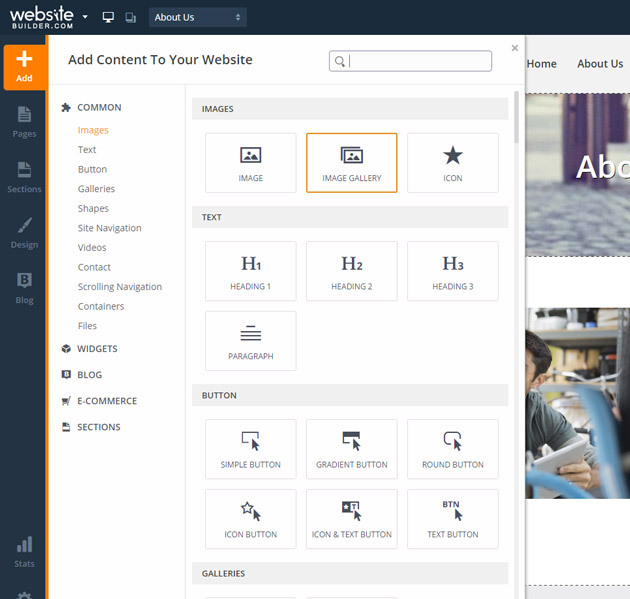 While the WebsiteBuilder.com builder is easy enough for a beginner to pick up and use, it has many advanced features and terminology that show that they are also catering to more advanced users who probably don’t like the limitations of most website builders. WebsiteBuilder.com uses HTML5 tags like <section> and <aside> and it’s the only website builder I’ve seen that divides up the page into sections as I mentioned above. They also use a lot of web designer type terms like Tile X, Z-index, Cover, <div> tags, and more. They don’t use these in a scary way where you’re screwed if you can’t figure it out, but they are tucked away so that geeks who know what they are can use them, but they won’t freak out the beginners. They are definitely not a requirement in order to create a site. WebsiteBuilder.com – What’s offered in free accounts? WebsiteBuilder.com does allow you to build a site for free and host it on a subdomain, for example, mine is webeminence.my-free.website. There are no limitations that I have found in actually building a basic site, so my recommendation would be to get a free account and start playing around with it, spend some time building the site, then upgrade when you’re ready to attach your custom domain or need access to some of the other upgraded features. 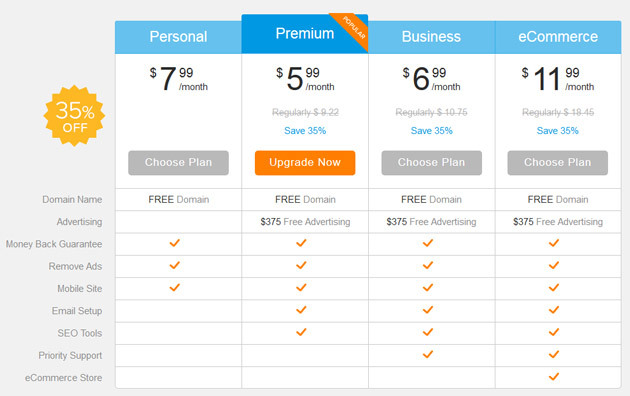 When you’re ready to upgrade, there are a few options.ranging from about $8 to $20 per month. The lowest level account upgrade called “Personal” will work for many people with email, SEO tools, priority support, and e-commerce being the major reasons to upgrade. They are currently offering a free domain, but for $10/year, I usually recommend that people purchase a domain elsewhere so they can easily migrate their site later without worrying about ownership control of their domain name. DISCOUNT!! Make sure you click around your account before upgrading. There are some major discounts offered when you purchase on a 1 yr or 2 yr contract. When I was testing out my account, the discount was as high as 70%. I’m sure that will change in the future! Marketing Tools that are Actually Useful! I don’t usually expect much from website builders in the realm of SEO. Usually if they just provide the ability to easily add SEO meta information like page title and description and edit the page URLs, that’s enough for me. 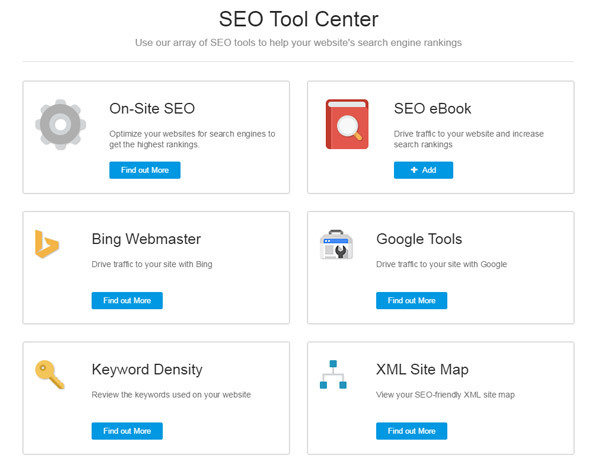 WebsiteBuilder.com has some useful tools in addition to basic SEO editing like a keyword density report, XML sitemap, and links to Google and Bing Webmaster Tools. They also provide easy integration with Google Analytics. 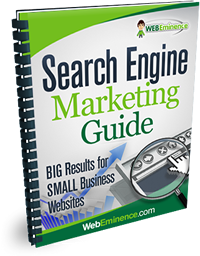 They also provide some other marketing help to new website owners like assistance in setting up a Google hosted email and Free ad credits for Google and Bing advertising. All of these marketing tools can be found on their own, but WebsiteBuilder.com packages them nicely in the website builder interface and shows that they know what is important when it comes to marketing and SEO for a small business website. I like to do some quick research to find out who is behind these website builders, especially when it’s not made obvious on the sales page. The website builder apparently originated with WebsiteBuilder.com but is now accessible through other website brands like SiteBuilder.com, Sitelio, A bunch of website builders like Sitelio, Sitebuilder.com, Sitey, ehost.com, and ideahost.com. Not sure if there are more and what the reasoning is here. Some of these were old established domains dating back to the 90’s and some brand new in 2014. So is it my favorite? Yeah – it’s my favorite website builder I’ve seen, but it may be because I have web design experience and like the advanced functionality of this builder. But there are a lot of other reasons it’s the best website builder I’ve seen. You can read about my other favorite website builders here and see where they fit in. What’s your favorite? Comment below and let me know. And feel free to ask questions. I try to answer them pretty quickly.